If you’re ready to experience vehicles in the Dodge lineup, simply contact us today. Billet Clearcoat 2018 Dodge Journey SE FWD 4-Speed Automatic VLP 2.4L I4 DOHC 16V Dual VVT We Love this Town!!! Billet Clearcoat 2019 Dodge Grand Caravan SE FWD 6-Speed Automatic 3.6L V6 Flex Fuel 24V VVT ABS brakes, Electronic Stability Control, Front dual zone A/C, Heated door mirrors, Illuminated entry, Low tire pressure warning, ParkView Rear Back-Up Camera, Passenger door bin, Remote keyless entry, Traction control. We Love this Town!!! New Price! White 2018 Dodge Journey SE AWD 6-Speed Automatic 3.6L V6 24V VVT AWD. We Love this Town!!! New Price! Blue Pearl 2018 Dodge Journey SE AWD 6-Speed Automatic 3.6L V6 24V VVT AWD. We Love this Town!!! New Price! Billet Clearcoat 2018 Dodge Journey SE AWD 6-Speed Automatic 3.6L V6 24V VVT AWD. We Love this Town!!! Brown 2018 Dodge Durango Citadel AWD 8-Speed Automatic 3.6L V6 24V VVT AWD. We Love this Town!!! Yellow Jacket 2018 Dodge Challenger R/T Plus RWD 8-Speed Automatic HEMI 5.7L V8 Multi Displacement VVT We Love this Town!!! White 2019 Dodge Durango R/T AWD 8-Speed Automatic HEMI 5.7L V8 Multi Displacement VVT AWD. We Love this Town!!! * MSRP is the Manufacturer’s Suggested Retail Price (MSRP) of the vehicle. It does not include any taxes, fees or other charges. Pricing and availability may vary based on a variety of factors, including options, dealer, specials, fees, and financing qualifications. Consult your dealer for actual price and complete details. Vehicles shown may have optional equipment at additional cost. A documentary service fee, up to $150, may be added to the price of the vehicle. 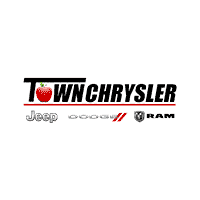 Why Lease or Buy a Dodge from Town Chrysler Jeep Dodge Ram? There are plenty of reasons why drivers from Yakima to Quincy choose Town Chrysler Jeep Dodge Ram when they’re looking for a Dodge 3-row SUV. Sure, we have a diverse selection of Dodge vehicles – from the safe and fuel-efficient Dodge Charger to the competitive Dodge Durango. And sure, we offer a rotating panel of lease deals and offers, new vehicle specials, and weekly specials. But we offer more than just great deals on Dodge vehicles: we offer a superior customer experience. That’s why, at Town Chrysler Jeep Dodge Ram, we like to say we treat our customers like family. Perhaps our enjoyable buying experience is why customers love us so much. If you’re ready to get started in buying one of our 14 new Dodge vehicles, estimate your monthly auto loan payments and then apply for financing online. If you have questions or if you’d like to schedule a test drive, contact us today.